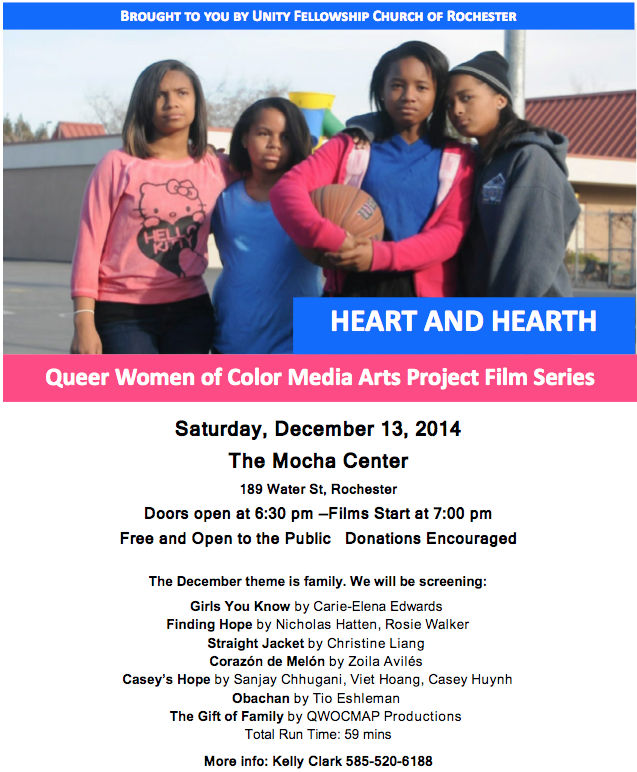 We’re so excited that the Unity Fellowship Church of Rochester is partnering with the Queer Women of Color Media Arts Project (based out of San Francisco, CA) to present the December film screening: Heart and Hearth, a focus on family at the Mocha Center. We hope you’ll take a couple of hours next Saturday to head out to the lovely Mocha Center to watch these great films and meet more folks from the Rochester community! • A young lesbian discovers the strength to be herself after FINDING HOPE in an accepting community. • Even a STRAIGHT JACKET is no match for the gale force voice of a young tomboy. • A queer Mexicana couple journey through online dating and across borders to find their CORAZON DE MELON. • The support of GIRLS YOU KNOW inspires a young girl to mold her environment. • For a Chinese-Vietnamese queer refugee, CASEY’S HOPE is found in starting a family of her own. • OBACHAN journeys from Tokyo to Little Rock where she is showered with the love of her chosen queer family.